There are some structural and physiological changes happening in one’s face, which makes you look tired, even if you do not feel tired at all. Aging, stress, pollution, loss of weight and sun damage contribute to these changes. You are a good candidate for facelift surgery if you face sagging of brows, droopy upper eyelids, and excessive folds on upper and lower eyelids along with eyelid bags and wrinkles. Frown lines on the forehead, forehead creases are some of the other signs of a tired look in some individuals. Overall, there is general sagging of tissues downwards as manifested by jowls and deepening of nasolabial folds. Along with these structural changes, the skin tone, texture, glow and complexion deteriorates too. Correcting a tired look needs a multi-pronged approach. The entire skin tone, texture complexion and glow needs to be improved. This can be achieved by a series of Combination peels, microdermabrasion, Rejuvenating Face Masks and LASER. Anything more significant surgical correction. Brow sagging can be corrected by Brow lift, often done in combination with upper and lower eyelid blepharoplasty, helps decrease the upper and lower eyelid folds and creases. Botulinum Toxin is an excellent option to get rid of forehead creases and frown lines. Jowls and deep nasolabial folds can be corrected by face lift or Fillers. Baggy eyelids or eyelid folds, pouches and creases are part of aging changes happening around the eye. These happen due to a combination of thinning and laxity of the skin around the eye and prolapse of the septum which holds the fat inside the orbit back. These can be corrected by an operation called blepharoplasty or eyelid tuck. To learn more about how to reduce baggy eyelids, or folds and creases around the eye, read about Blepharoplasty. Do you look older than you actually are? In the hectic pace of everyday life, you tend to ignore taking care of yourself and one day it hits you, when you look at yourself in the mirror. Sometimes comments made by colleagues make you notice these changes. Although genes play a major role, lifestyle is the main culprit. Sometime diseases and other illnesses may play a part. Increased exposure to sun, poor diet and water intake, exposure to pollutants in the air, stress and strain, all contribute to this. Hair loss is a major factor along with premature greying of hair. Loss of skin glow, increased coarseness of skin, poor texture, creases and wrinkles on forehead, smile lines, frown lines, jowls, deep nasolabial folds, marionette lines, sagging of the neck skin, deep folds on the neck and deep nasojugal grooves. Ptosis of brow, increased folds and wrinkles in upper and lower eyelid are some other signs of premature aging. Rectifying these changes would start with a good skin care regime along with Combination peels using alpha hydroxy acids and Microdermabrasion. 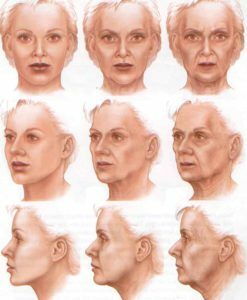 Botulinum Toxin for forehead creases, frown lines, and smile lines. Sometimes Brow lift, which takes care of sagging brows, can take care of these things more significantly. Upper and lower eyelid blepharoplasty takes care of upper and lower eyelid folds and creases. For milder cases, peel off masks, electrophoresis treatments and retinoid work wonders. Facelift takes care of jowls and nasolabial folds. For those who want non-surgical option; Pixel laser, combination peels, radiofrequency skin tightening and fillers are the options. The sagging neck is corrected by Neck lift. Loss of elasticity of skin, loosening of ligaments and gravity, induce changes in the neck, which contribute to aging. There is appearance of transverse folds, wrinkles and gravity induced platysmal bands. There could be increased fat in the area under the jaw, which sags down too. Rejuvenation of the neck is chiefly surgical and involves correction of the structural changes, such as lifting and tightening the sagging platysma, removing the excess sagging skin and liposuction of the under chin area. This lifts the neck up and tightens it. It gives better contours to the jaw and better youthful looking neck. Sometimes, Botulinum Toxin can be used to relax the tight neck muscles and improve the appearance of the jawline; the transverse wrinkles or creases can be filled with a hyaluronic acid filler. Read more about this in the section on Fillers, Botulinum Toxin and Facelift. A young youthful face is devoid of smiles lines, creases and wrinkles. Crows feet are the tiny smile lines that start appearing on the side of the eyes when we smile. As the skin thins, it buckles when the facial muscles contract. At the site of constant buckling, the skin thins and hence the wrinkles become significant. Smile lines are like blemishes on a flawless face. These small creases can make one look older than one is. Crows feet and smile lines and wrinkles appear as we age, suffer sun damage, pollution and neglect skin care. These signs start appearing on the forehead and around the eyes. However initially they appear at animation, i.e. when we are smiling and talking (Grade I). Hence, these are more predominant in those who smile a lot using the eyes while animating. The skin over these muscles thin down and creases which appear on animation start becoming visible even when we do not animate. ( Grade II). Prevention is better than cure. This age old adage is applicable here. Proper skin care, which includes exfoliation, toning and tightening through regular use of moisturizers, a healthy diet which is high in vitamin C, and regular application of skin vitamin creams will slow down the appearance of these changes. We provide Facial treatments which are high in these ingredients and are quite therapeutic. However, Botulinum Toxin can get rid of these wrinkles around the eye or forehead, quite easily. For the advanced wrinkles, a combination of facial fillers and Botulinum Toxin is needed. For more complex wrinkles, if to be treated by the non surgical way; then facials, AHA peels, Fractional or ablational laser may be needed along with Botulinum Toxin and fillers. Hair loss is a problem which is affecting more and more of the youth and young people of our era. This phenomenon is particularly problematic in Indian subcontinent. The exact cause is not known, but is best explained by a multifactorial hypothesis. Hair loss could be secondary to a particular problem, such as infections, hair plucking, ticks, dandruff, severe illnesses and chemotherapy drugs, but more often it is primary i.e its cause is not known. Here a genetic trait is the underlying factor. In males, it presents as male pattern baldness – which typically starts as temporal recession and progresses to loss of hair on the crown. The sides and back hair is never lost. In females, the hereditary hair loss is seen on the crown as decreased density. A multitude of factors can hasten the onset of hair loss. Stress, poor diet which lacks class I proteins, lack of sleep, smoking etc. Recognising these and rectifying these factors can delay hair loss. Medical treatment aims to improve the blood flow to the scalp, block the effect of testosterone and improve the nutritional status. This can reverse early hair loss, but cannot reverse established hair loss, where the follicles have become atretic and obsolete. Hence prevention is better than cure and for early hair loss, we have spa therapies to retard hair loss. Mesotherapy, where these agents are injected in to the scalp, is still in early stages to quantify its outcome. The only option for significant improvement is micro follicular hair transplant. Read more on micro follicular hair transplant. Nose correction is required in the following four cases; i.e. if the nose is deviated, it is broad in shape, depressed or nasal hump. The nose can get deviated leading to a crooked nose due to one of the following reasons. It could be due to an injury you may have sustained during the developmental period. An injury due to a fall or hit on the nose, which leads to a fracture of the nasal bones or septum, is by far the most common cause of deviation. However, the nose can get deviated even without a history of such an injury, and is a result of differential growth of structures in the nose, especially the bones and cartilage. Correction of deviation of the nose should be done after the period of growth of the nose is over, i.e sixteen years. Often cosmetic improvement can be combined along with it, such as reduction of a hump of the nose, augmentation of a depressed nose, narrowing of the nose or tip etc. It is important to realize that the twisted cartilage of the nose has a memory like a spring and has a thirty percent tendency to spring back to some deviation of its original self. This is a common problem. Mostly genetic, but could also be developmental. Sharpening and narrowing such a nose is a common request. A broad nose is one which has a wide alar base. If the alar base is wider than the inner angles of the eye, or the whole nose is wider than the width of the eye, it is said to be broad. The bony side walls of the nose should be eighty percent of the width of an ideal width nose. In a broad nose, it is perfect of the width of the alar base. A boxy tip is one which is rounded, wide and curved. It often looks like a button on the tip of the nose. Narrowing such a nose has to be customised as per the requirement. If the bony part is wide, then an osteotomy and infracture (moving the bony side walls of the nose in) is required. This could be due to genetic traits, but often it is developmental. The nasal bridge is low. The take off of the nose from the face is low. Ideally it should be at the level of the upper eyelash line, when seen in profile. Sometimes the nose is depressed due to injury on the bridge of the nose or surgery. If during the surgery too much of the septum is resected, a saddle deformity develops. Often the nose develops a bump or a protrusion ( like a hump) on the top. This can also make the nose look like a parrot beak. It is possible to correct the nasal hump by Rhinoplasty. The bony and cartilagenous excess is shaved off and the nasal framework is reconstituted. The tip of the nose is often pointing downward, this is lifted at the same time. Read more about these corrections in the section on Rhinoplasty. Ear Problems are mostly developmental. However, sometimes people are born with badly shaped ears. The commonest problem with ears is prominent ears or Bat ears. In this condition, the ears are bent more forward than they should be. This makes the ears look more prominent. Sometimes they are also larger than normal. Sometimes only one side can be affected, but often both sides are prominent. This condition can sometimes be corrected by non surgical methods such as taping the ears back, but this is only possible if done within 1 month to one year after birth. After that, only surgical correction is the option. The prominent or Bat ears can be pushed back with strategically placed stitches in the cartilage. This is done through a posterior approach, hence no scar is visible. This also does not lead to any significant deformity of the ear. The risks and potential complications following this procedure are also few. Sometimes, the ear is large and needs reductions, but many times, the ear is small or cup shaped and suitable corrective ear surgery is necessary.